Today, the market is full of snazzy ice creams, gelatos and yogurt frozen treats. But good old classics are always a favorite. Take the ice cream sandwich. Creamy soft ice cream sandwiched between a pair of homemade cookies…that’s what I call heaven! 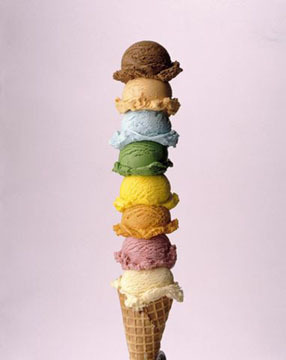 With so many great ice creams on the market it’s easy to “sandwich” your own. How about Ben and Jerry’s Cherry Garcia – with chunks of chocolate and cherries folded into rich vanilla bean ice cream and sandwiched between Homemade Chocolate Chip Cookies with dried cherries and almonds. Yes please! Or Gingersnaps with Summery Local Peach Ice Cream. Yum! And we can’t forget the ice cream float! The classic vanilla ice cream and root beer is always a favorite – but how about something totally different? Use locally made soda and ice cream with new flavors to take this to a whole new level! Like Not-too sweet Vanilla Bean DRY Soda is so d’lish when poured atop a big scoop of Molly Moon’s Honey Lavender ice cream! Now that’s a local float! But if you really want to go old-fashion – try making your own homemade ice cream! My Fresh Mint Ice Cream with Chocolate Mint Candies will transport your taste buds to your childhood. I like to serve this garnished with a bit more chopped mint candy and a fresh sprig of mint. Combine the cream and sugar in a large, heavy saucepan. Tear the mint sprigs (to bruise them) and add to the cream mixture. Bring to a slow simmer over medium heat. In a bowl, whisk the egg yolks, then gradually whisk in about 1 cup of the hot cream mixture. Whisk the egg mixture into the cream. Whisking constantly, bring to a bare simmer and cook for about 30 seconds. Remove from the heat and whisk frequently to cool to room temperature. Refrigerate for at least 2 hours. Strain the mixture and discard the mint leaves. Stir in the chopped mint, then pour into an ice cream maker and freeze according to manufacturer’s instructions. Just before the ice cream is finished, stir in the chopped candies. Transfer the ice cream to a plastic container and freeze until ready to serve. In a medium bowl or double boiler, melt the chocolate, butter, salt, and extract together over a pan of barely simmering water, whisking until the chocolate is just melted. Remove from the heat, sift in the confectioners’ sugar, then stir to combine well. Spread the mixture in an 8-inch square baking pan. Let cool at room temperature for at least 4 hours, or refrigerate to harden faster. To remove the candy from the pan, invert the pan onto a piece of plastic wrap or a cutting board, lay a hot towel over the pan bottom for about 1 minute, then tap the bottom of the pan. Loosen the candy with a spatula if needed. Cut the candy into 24 pieces to serve as candy, or coarsely chop to use in ice cream. Store refrigerated for up to 2 weeks. Gazpacho is the most widely known cold soup. 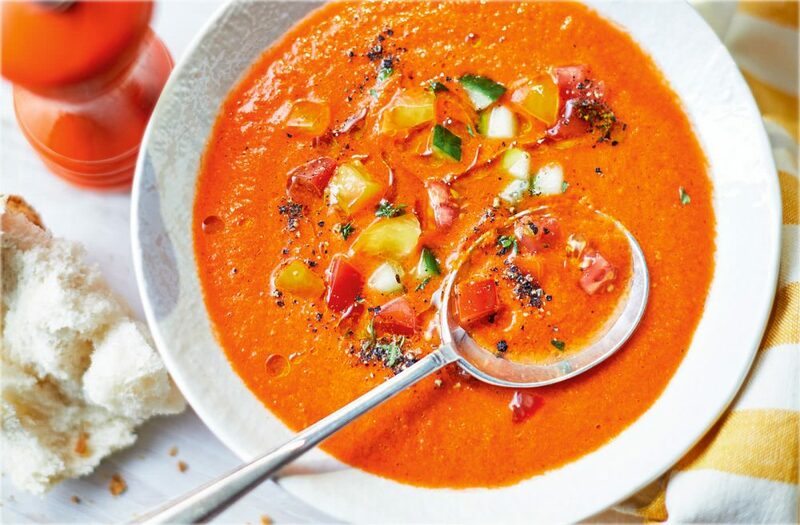 Originally from Southern Spain, this fresh tomato based soup is a summertime staple… and such a refreshing and delicious way to get your vegetables! I like to add lots of veggies into my gazpacho like cucumbers and pepper and top it with some Alaska King Crab for a real splurge! Just think you won’t even have to turn on the stove for an elegant meal on a hot summer night. Tomatoes aren’t the only celebrities when it comes to this genre of soup – there are lots of cold summer fruit soup recipes too! Juicy, ripe melons can also be the star – like in my recipe for Thai Chilled Melon Soup with Shrimp and Fragrant Herbs. This soup combines creamy coconut milk, bold Thai red curry paste and zesty ginger and lemongrass, then gets topped with a pouf of sweet bay shrimp and crunchy water chestnuts. Season it up with a hit lime juice, basil and mint – it’s the meal to cool off with! Fresh Bing Cherries also make for a tasty cold soup when cooked with spices and wine, chilled then swirled with sour cream. Savory, sweet and lush –mmmmm! Chilling out has never tasted so good! Quick: name 3 perfect side dishes for your next barbeque. I bet fruit salad was on that list! It’s the perfect way to celebrate Summer produce – and stay cool! One of my favorite d’lish tricks is to mix fresh lemon juice with a little local honey then add in some chopped fresh mint from the garden. Toss this with juicy peach wedges or halved apricots – yum! Or how about grilling thick slices of pineapple and then sprinkling them with a touch of ground chipotle chili, a squeeze of lime, and a quick scatter of chopped cilantro. My mouth is watering just thinking about it. Icy cold watermelon chunks are terrific when tossed with feta cheese, chopped fresh basil, Kalamata olives and a light drizzle of extra virgin olive oil! Now that’s a NEW salad everyone will love! 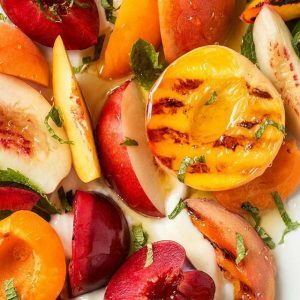 Really WOW the crowd with my Succulent Summer Stone Fruit Salad with Lavender Lemon Honey Syrup. The name is a tongue twister – but the flavors will truly blow you away. Fresh lavender flowers for garnish, if desired. To make the lavender lemon honey syrup: In a small heavy bottom sauce pan combine the honey, water and lavender flowers. Bring to a low boil over medium heat – being careful that it does not foam up. Slowly simmer for about 10 minutes or until like thin pancake syrup. Remove from heat and cool to room temperature. Then add lemon juice and strain. Store refrigerated for up to 2 weeks. Bring to room temperature before using. To serve: In a large bowl toss with the lavender lemon honey syrup. Garnish with fresh lavender flowers if desired.